Effective fire prevention and survival skills—life skills that can protect young lives now and in their future lives—are more than school fire drills, a session of stop, drop and roll, or a mention of pot holders during a cooking lesson. Children and teens with intellectual disabilities are at higher for preventable injuries, including fire and burns. Teens are an especially important group to reach with effective fire safety skills, because they are approaching an age when many will move into more independent living situations—where their risk increases. 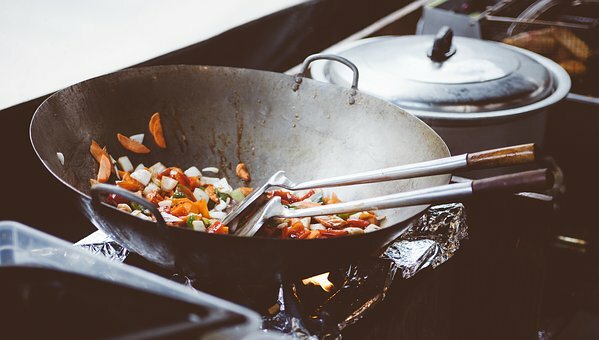 This article includes six modules for lessons and classroom activities, discussion prompts and take-home materials that cover the key skills of kitchen safety, smoke alarms and exit plans, and calling 911. Get the full article and fire safety lesson plans. When children reach about 14 years of age, most parents feel confident about leaving them home alone for a certain amount of time. For parents of teens with intellectual disabilities, though, that decision is more complicated. Will their child know how to respond if there’s an emergency, get out if the smoke alarm sounds, and call 9-1-1? Recently Dr. Robert Cole of Community Health Strategies presented a fire safety seminar sponsored by Prevention1st to faculty of the Cooke Center for Learning and Development in New York City. The Cooke Center provides special education services for students ages 5 through 21 with mild-to-moderate cognitive or developmental disabilities and severe language-based learning disabilities. One of the take-aways they have incorporated into their curriculum is the importance of learning and practicing what to do when the smoke alarm goes off. 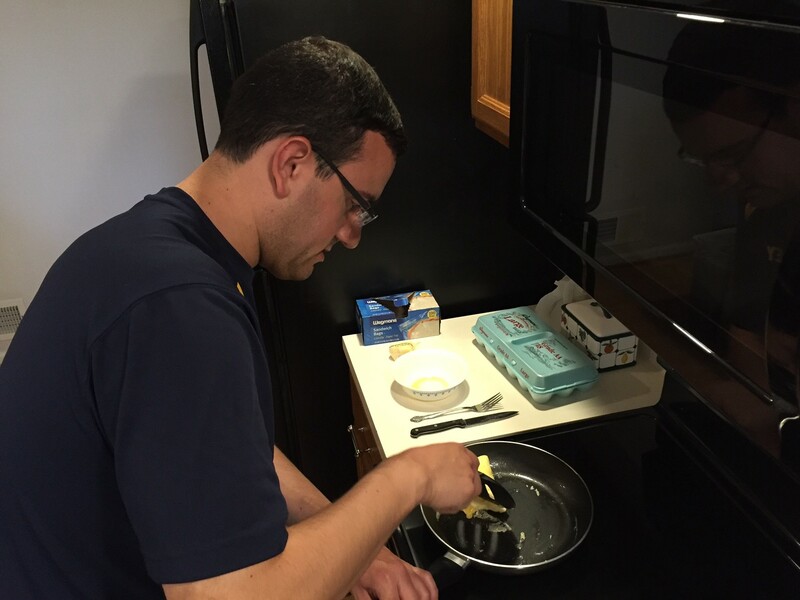 “Fire safety has always been a topic we’ve covered, but Bob’s seminar really brought out how important it is to have a specific plan if there’s an emergency,” said Virginia Skar, CCC-SLP, Chair of Adaptive Services at Cooke Center. The Center has now integrated exit planning into the journal the school creates as part of parental involvement in educational planning, goal setting, and review of their child’s progress. Cooke Center also successfully used play safe! be safe!, a fire safety program developed by BIC Corporation for use with young children, as part of the spring semester’s health and safety life skills instruction for their 14- to 18-year-old students. People with developmental disabilities are at higher risk for injuries, and as they move into more independent living their risk increases. While unintentional injuries are the leading cause of death for everyone from age 1 to 44, people with intellectual and developmental disabilities are at even higher risk. People with such disabilities are 4 times more likely to die in a fire, 6 times more likely to die from a fall, and 6 times more likely to die from drowning. The belief that unintentional injuries are unpredictable—“accidents will happen”—and thus we can’t do anything about them can increase risk for anyone. When caregivers or supervisors hold this belief it is a primary risk factor for people with developmental disabilities. While this attitude may reflect the caregivers’ experience, it also seriously undercuts motivation and willingness to even pay attention to the issue of injury prevention. 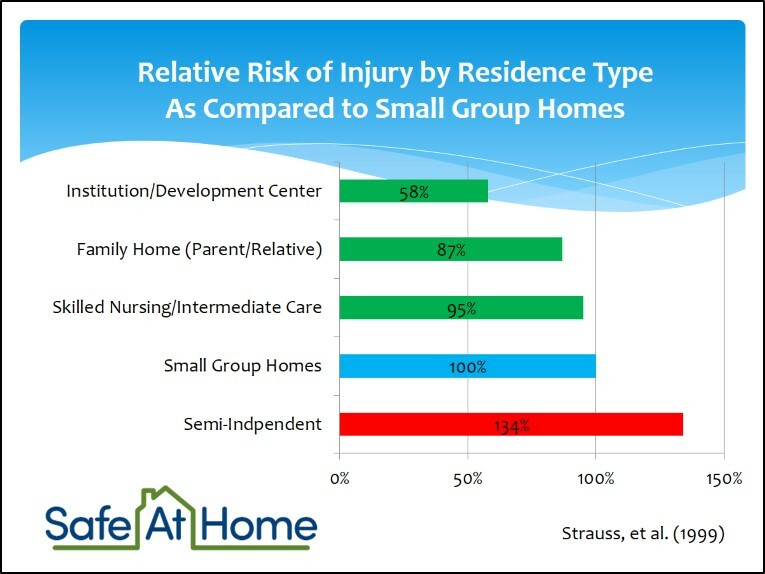 The risk of injury for people living in institutional settings is only 58% of the risk for those living in small group homes, while the risk of injury for those in semi-independent living is 34% greater. This is true even though individuals moving into semi-independent living (Defined as “one or more persons with developmental disability live in a separate residence with periodic visits by staff who provide various services”) are typically those with the highest level of function. The risks of greater independence will only increase in the future. The U.S. Supreme Court’s 1999 Olmstead decision required states to provide people with disabilities the necessary support and services to live in the most integrated living setting. In 2009, the U.S. Department of Justice (DOJ) began an “aggressive effort to enforce” Olmstead nationwide. As one example, in 2013 DOJ reached a settlement in a New York case requiring that within five years, the state will assess current adult care home residents, transition them to supported housing if appropriate, and provide supported employment and community mental health services. The experience of Prevention 1st safety trainers is that people with developmental disabilities understand that they are at risk. They are concerned about their own vulnerability, in terms of both general personal safety and home safety, especially fires. In 6 years of providing training for clients at the ARC of Monroe, CDS Monarch, Hillside, PRALID, Ontario ARC and other agencies supporting people with developmental disabilities, we have found participants are enthusiastically engaged. They share their many concerns, ask a range of questions, express frustration with the lack of real fire prevention training, and are especially worried about escaping in a fire. They want to develop functional skills around safety, and they remember our advice when we return the following year. We have not met with one person involved in the disabilities community who has not said that safety is a major, and largely unaddressed, concern for people with disabilities living independently and those who care for and about them. Despite the fact that families and caregivers self-report major concerns about fire safety (Prevention 1st, 2015) , previously there has not been a comprehensive, individualized training program to ensure they have the skills to live as safely as possible. No such training had been required, or offered with any consistency, by the myriad organizations that serve people with ID (OPWDD, 2016). 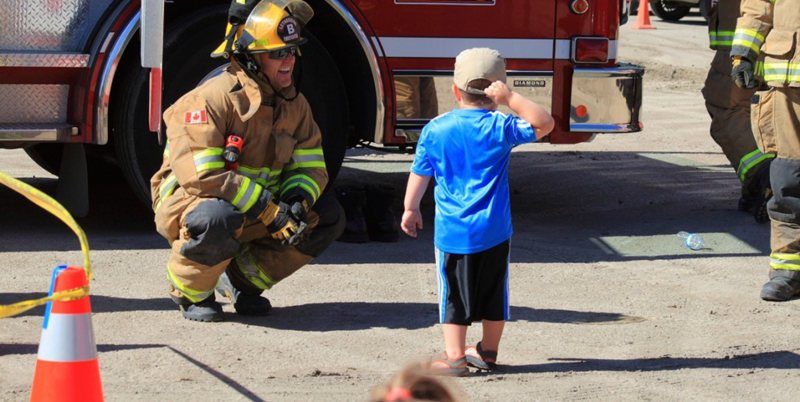 Prevention 1st and its expert partner Community Health Strategies have developed Safe at Home, an evaluated curriculum for teaching fire safety and injury prevention skills to people with disabilities who are or are preparing to move into independent living situations. Who Needs Injury Prevention Education? Everyone! 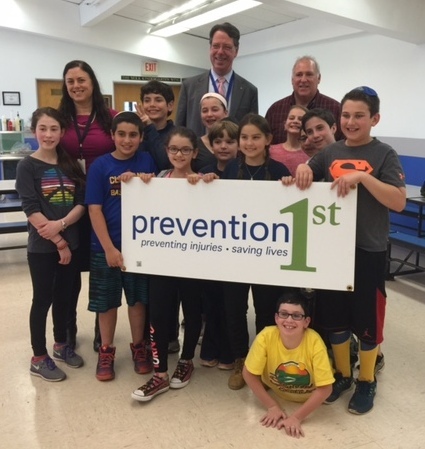 5th- and 6th-Graders at Hillel Community Day School learned about home safety to teach their schoolmates. Residents of low-income communities, through Habitat for Humanity. Learn more about Prevention 1st‘s Programs.